I love this picture of Drake and me. 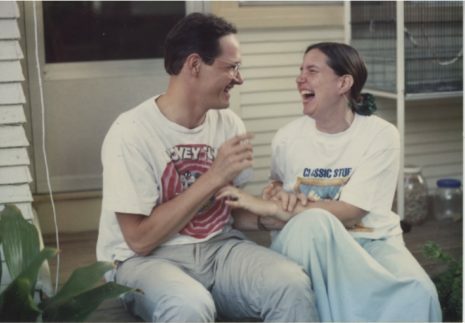 It was snapped while we were sitting on the porch of my house in town before we were married. It was completely spontaneous, we didn’t dress for the occasion, but on close inspection you see that the labels on our T-shirts read “Looney Tunes” for Drake and “Classic Stuff” for Jan. The Warner Brothers cast of characters meet Rocky and Bullwinkle’s crew. How has this image proved to be prescient? The blending of any two styles when people share physical space is challenging, as anyone who lives with anyone can attest. Drake and I may be even more disparate than the average couple in our desire for order and tolerance of chaos. From outside, it is almost an “Odd Couple” kind of match. Looney and classic together. Drake is exuberant, I am methodical. Drake loves complexity, I long for simplicity. What makes it work? When I look at this picture I see the answer. Laughter. It is not that we laugh together at the same jokes, it is that we laugh at ourselves together. We recently watched a TV episode in which two detectives entered a house where a brother and sister lived together. The living room was divided with a double line of duct tape that ran across the floor and up the walls of the room. One side of the room contained feminine knick-nacks all in perfect order, the other was a cacophony of papers, magazines, books, power tools, and projects. Drake and I looked at this caricature, then looked at each other and burst out laughing, together. At them. At us. I am grateful for Drake every day. Duck meets Elf; expect laughter.